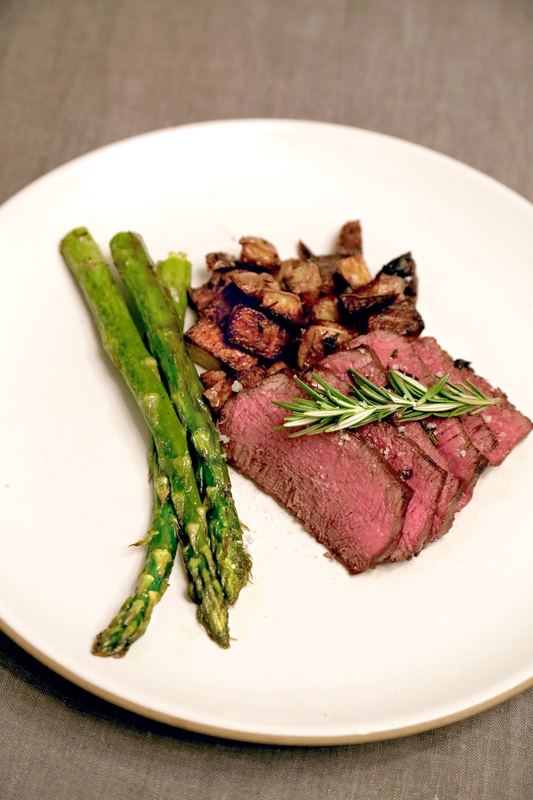 Generously season steaks with Salt and Pepper and add the aromatics like rosemary, thyme and garlic to the sous vide bags and vacuum pack steaks. Put in 128F water bath for 1 hour (2 hours if cooking from frozen). We like 128F for the perfect medium rare temperature. Adjust up to 135F for medium or down to 123F for rare. Remember, we are going to sear these steaks afterwards and that will add more heat. Preheat cast-iron skillet with a tablespoon of vegetable oil (or other high-temp friendly oil) and a tablespoon of unsalted butter over high heat. Remove steaks from water bath and dry each steak very well (crucial step to achieving the perfect sear).